By combination of the leaves selected for this cake and the closely controlled fermentation processing, Mr. Hu carefully crafted this puer to have less earthiness and more sweetness. This shu puer cake was made from tea buds and tender leaves (grades 1 and 2) which were fermented two months before being pressed into cakes. 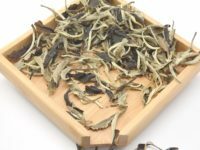 The creators of this tea, Mr. Hu Hao Ming, a 3rd generation tea producer, and Wang Xi Qun like to source the mao cha (uncompressed green puer tea leaves) by themselves. By combination of the leaves selected for this cake, and the closely controlled fermentation processing, this cake is carefully crafted to have less earthiness and more sweetness. Ma Guo Tou means the leader of a horse train, which was the method for transport of puer in ancient times. The leaders of these horse trains, naturally, were inclined to drink the very best tea available. As result, these Ma Guo Tou were highly regarded as judges of a tea’s tea quality. The picture on the cake’s wrapper is a depiction of Wang Xi Qun’s face, who was himself a Ma Guo Tou back in the 1970s. His job was to source tea deep in the forests, and make sure the horses and workers were transported safely from place to place. Wang Xi Qun is very respectful to minority groups in Yunnan, who own most of the tea trees in the forests, even now. He has built relationships with these minority groups for years, allowing him to source tea from very old wild tea trees. This tea was plucked from bushes between forty and one hundred years old in the heavily forested Jing Gu county. In 1978, in Jing Gu, a tea scientist found a fossil of an ancestor for the tea plant from over 35 million years ago called Kuan Ye Mu Lan, making a strong case for the region being the place where tea first evolved. Jing Gu is home to the Dai and Yi ethnic groups, who have lived with tea as part of their life for a millennium. Jing Gu’s subtropical monsoon climate does not just suit tea plants, but also champagne mango trees, which bear the county’s next most famous crop. The biodiversity of its forests influence the character of its tea profoundly, and some even insist that the teas capture a shade of flavor from those mango trees in the deep layers of their body. This tea was produced by the biggest tea company in Jing Gu, which use to be owned by the government. They have a highly skilled method for the fermentation process. Jing Gu has a long history of producing tea and is the hometown region of mangos. In spring, tea is harvested more than 10 times from March- April to make mao cha. The mao cha is piled about 2 1/2 feet high in the production factory and covered with large sheets of fabric. The environment is full of microbes necessary for the fermentation process. The mao cha still has lots of moisture and enzymes, and over the course of 90 days (30 days longer than most tea companies) the tea will slowly oxidize and ferment. Heat is created inside the fermenting tea. Every few days, workers under the supervision of Hu Hao Ming will separate the leaves by using wooden shovels to move the entire pile of tea to the other side of the factory. After the fermentation process is finished, all the tea becomes loose shu puer tea. They will use sorting machines to sort out all the leaves in to different grades. The smallest sized leaves are 1st grade, increasing all the way up to large leaf 10th grade. After the sorting process, they select the first and second grades of leaves and tea buds to steam and compress into Ma Guo Tou cakes. Using these small leaves creates a cake similar to the Qing Dynasty royal family’s favorite shu puer cake. This very special cake was produced by the Cha Ma Si Tea Company. The bright red color of the infused tea indicates very concentrated nutrition. Its flavor is full-bodied but not heavy, with a pronounced sweetness in the aftertaste. During fermentation, the tea will stick together, once every few days, they shovel the leaves to separate them. A heap of tea leaves during the fermentation process. Heat builds inside the fermenting tea. The once green tea leaves become a reddish brown after 60 days of fermentation. Sorting out old leaves from the mao cha. Weighing loose, dried puer tea leaves. The company's trademark is placed on top of maocha and pressed on the top of each cake. Wet puer tea cake drying on wooden shelf after steaming. Hand wrapping each dried puer cake. Finished product of Ma Guo Tou tea cake. Bamboo shells bind 7 cakes together to prevent damage from sun and rain. The traditional way of bundling together puer cakes for transporting.